Nearly all internet warnings are fake. As you browse the web, pop up virus infection warning may appear. If you're scared of virus on your computer you can be an easy target. 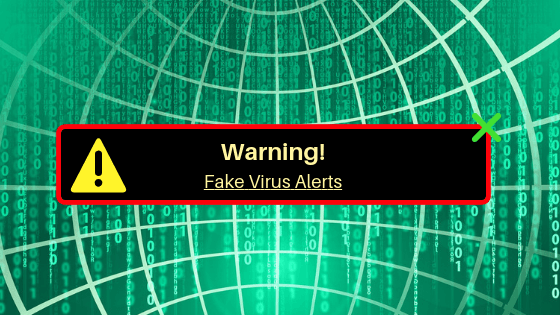 Fake virus alerts are known as "scareware". These warning messages are meant to scare a user. They claim that your computer had been infected by a virus. Users are asked to scan and fix this by visiting malicious websites or downloading anti-virus. The warning is the viruses itself! Interacting with scareware invites malware to your computer which may damage your computer. They can also use this as a way to get data on your computer that can further be used for hacking and identity theft. Do not panic believing that your computer has viruses. Once you panicked you might just click the warning as the best solution without even thinking. Don’t click "No" or "Cancel," or even the "x" as well as links anywhere of the warning. In some cases these buttons can actually trigger the program to activate. For Windows user: press Ctrl + Alt + Delete to open your Task Manager, and click "End Task"
For Mac users: press Command + Option + Q + Esc to "Force Quit"
Want more techie tips? Bookmark our KC News to easily access and read updates! Be sure to also follow us social media.